It is the terminal section of the nonrespiratory conducting airway. This bronchiole gets subdivided into respiratory bronchioles. The Terminal bronchioles are referred to as the last of the purely conductive airway generations in the human lungs. It is located at the terminus of the conducting zone. It has a diameter that approximately ranges between 0.5 to 1 mm. 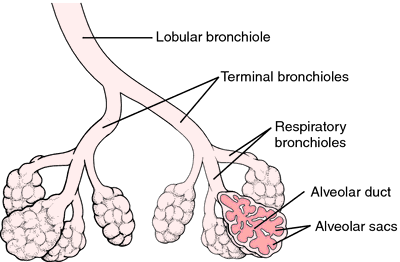 This bronchiole gets subdivided into respiratory bronchioles which comprise of only a few alveoli. Simple cuboidal epithelium, comprising of Clara cells, line the Terminal bronchioles. The walls of the Terminal bronchioles contain only a small number of ciliated cuboidal cells, connective tissues and a limited number of smooth muscle cells. It supplies oxygen to each pulmonary acini in the body. The main function of these tubular structures is conduction of gas and they are too thick to allow the exchange of air. It is the most distal portion of the conducting zone that branches off the lesser bronchioles. 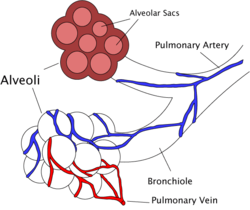 Every single terminal bronchiole gets divided to form respiratory bronchioles that comprise a small number of alveoli. A simple cuboidal epithelium lines up the structure. This epithelium contains club cells, which are rounded and non-ciliated cells that secrete non-sticky protein. The secretion is known as a surfactant and it helps in the maintenance of the airway in the tiniest bronchioles that take part in the process of respiration. The secretion also enables the reduction of the surface tension that allows bronchioles to expand while inspiration, thereby restricting the collapse of the same during expiration. Though there is no direct involvement of the structure in causing diseases, any respiratory disease that affects a body sees some kind of involvement from these distal segments of the respiratory zone. While asthma, influenza, bronchiolitis obliterans, etc. are some curable or controllable respiratory disease that involves terminal bronchioles, Bronchospasm is one of the life-threatening condition of a human body. It occurs when the smooth muscular tissues of bronchioles constrict severely, thereby causing contraction of their diameter. It is treated by oxygen therapy as well as bronchodilators, including albuterol. Check out these useful images to know how these bronchioles look like.